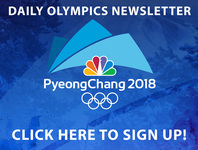 Here are the Olympians to watch in NBC's primetime coverage on Friday, February 23 at 7:00 p.m.
Justin Olsen, who underwent an emergency appendectomy when he arrived in South Korea less than two weeks before the competition, piloted the top American sled in 14th place. Nick Cunningham’s sled finished 21st and Codie Bascue’s sled was 25th. Each will be hoping for a higher finish in four-man, but winning a medal will be a tall order. German pilot Francesco Friedrich is favored to medal again in the four-man, and fellow pilots Johannes Lochner and Nico Walther have the tools to jump onto the podium, too. Joey Mantia is the most promising American competing after winning the 1000M at Oly mpic Trials. Two-time Olympic gold medalist Shani Davis finished second to Mantia at Trials to qualify for his fifth straight Olympic team, but came up short in Sochi in this event. Kjeld Nuis of the Netherlands is a front-runner, having already won the 1500M in PyeongChang, while Canada's Vincent de Haitre and Norway's Havard Lorentzen are also podium favorites. Tonight, the Olympic's first-ever Gold in men's snowboard Big Air will be awarded. The favorites are Canadian riders Max Parrot and Mark McMorris - both athletes won slopestyle medals (silver and bronze, respectively) - and are just as good, if not better, in big air. The U.S. has three athletes in the final, including slopestyle gold medalist Red Gerard. However, the 17-year-old doesn't consider himself a big air rider, so the top medal hope for Team USA might be Chris Corning or Kyle Mack. In the Winter Olympics debut of the team event, 16 countries are represented by four skiers each, and they compete head-to-head in an elimination-style tournament. The U.S. will be represented by the likes of Tirica Mangan - the rest of the team has not been announced yet, as Mikaela Shiffrin, Lindsey Vonn, and Ted Ligety opted out. After claiming super-G gold in alpine skiing earlier in the Games, Ester Ledecka of the Czech Republic is expected to be a top contender in this snowboarding event. Austria’s Benjamin Karl, a two-time Olympic medalist, fractured his ankle and tore two ligaments in December, but returned to win a World Cup race in January and could still contend. Bulgaria’s Radoslav Yankov won the overall World Cup title last season, and will look to become the first from his country to win an Olympic snowboarding medal. Italy’s Roland Fischnaller, who has had success at Worlds and on the World Cup circuit, will look to make his first Olympic podium in five Games. American AJ Muss has had promising top-10 showings this season but is not a consistent contender.